If you are searching Competition Power magazine in Hindi language or SSCadda's magazine, then this is easily available here. Here, we are doing our best to cover all the aspects of current affairs in the exam. Let it be SBI PO, Indian Bank, SSC CGL or any other exam you name, we are covering the current affairs in such a way that can help you a lot in clearing the exam. 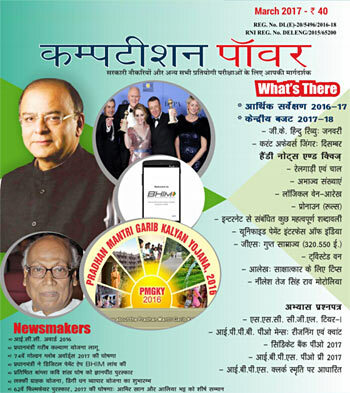 Not only this, March Edition also covers Economic Survey 2016-17 and Union Budget 2017-18. To download these Competition Power magazine, click on the link given below. In which, in the next window the PDF file will be open. Which can be read easily and can save the file downloading the PDF.